Because I can easily inhale several bowls in one sitting, I try not to eat pasta very often. So if I know that I'm going to turn into a whiny, lethargic sloth for several hours, I like to be prepared. This preparation includes lots of strategically placed pillows on the living room floor, a few favourite movies (Thank you, Netflix, for being the best invention since pay-at-the-pump), and of course, any dessert that's just as coma inducing as pasta. 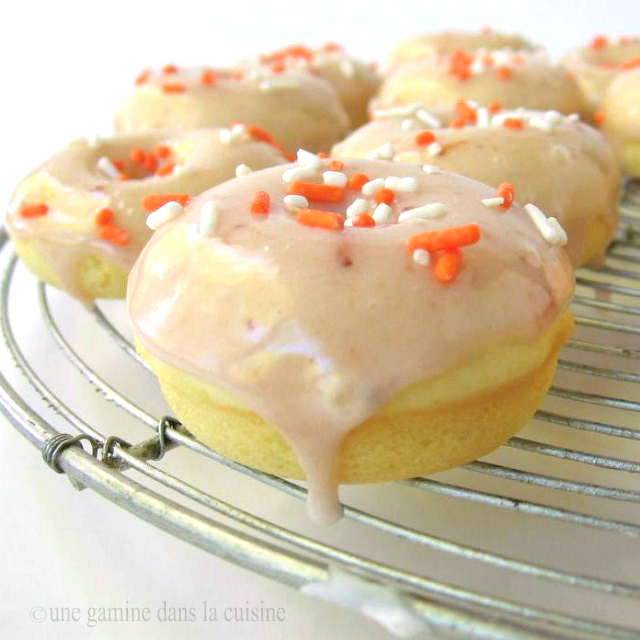 On just such an evening, I made these adorable mini doughnuts. It's equally adorable that mini versions of desserts come off as innocent and inconsequential. At least they're baked. That counts for something, right? I don't care, really. They were spectacular! Earlier this summer I won a Williams-Sonoma gift certificate from Laura, of the beautiful blog, Tutti Dolci. Along with a pie crust protector (the baker's version of a pocket protector), I bought a mini doughnut pan. I am in love with both! I was a little bit worried that these might end up on the dry side, but they were surprisingly moist! Fueled with enough sugar craving, the doughnuts could be enjoyed even without the glaze. And speaking of the glaze, feel free to use any kind preserves. Or, if you prefer, you can brush the doughnuts with melted butter and roll them around in cinnamon and sugar. In the bowl of a stand mixer, combine the granulated sugar and lemon zest. Use your fingertips to work the zest into the sugar until it becomes moist and fragrant; Set aside, allowing the mixture to marinate while you prepare the other ingredients. In a separate, medium-size mixing bowl, whisk together the flour, baking powder, baking soda, and salt. ; Set aside. In another separate bowl (or a measuring cup), whisk together the buttermilk and whole milk; Set aside. Add the butter to the stand mixer bowl containing the lemon/sugar mixture. With the paddle attachment, beat the butter and sugar mixture together on medium speed until light and fluffy (about 2 minutes). Scrape down the sides of the bowl and add the egg. Beat for about 1-2 minutes. Pour a scant Tablespoon of batter into each well. [Note: I found that it was much easier to use a piping bag fitted with a large, plain tip.] Don't overfill the wells, the batter should just reach the edges. Remove the pan from the oven and allow the doughnuts to rest for about 2 minutes before inverting the pan onto a cooling rack. Once all the doughnuts have been removed, wash, dry, and re-spray the pan, and repeat until all the batter is gone. Cool the doughnuts completely before dipping them into the glaze. Prepare the glaze: In a medium-size mixing bowl, whisk together the apricot preserves, confectioners' sugar, and lemon juice until smooth. If it's too thick, add a splash more lemon juice. If it's too thin, add about 1/4 cup of confectioners' sugar. The glaze should be on the thin side, but feel free to add even more sugar if you prefer a more frosting-like consistency. Dip each doughnut into the glaze and set them on a wire rack with a sheet of parchment paper placed underneath to catch any drippings. The little gems are best enjoyed on the day they are made. If you want to keep them overnight, store them in an airtight container. Just look at that dripping glaze! Yes please! I was just thinking about your doughnut pan today and wondering when we'd see your first creation. This post is so timely!! These are so adorable and I'm in love the with the apricot glaze. You are too sweet to mention me :). Addictive! That glaze is fabulous. You're the second blogger recently to talk about not liking romantic comedies (or maybe you did twice?). I'm so with you on that one! Not a fan. But I AM a fan of your yummy looking donuts! Holy cow - I need a donut pan, stat. Baked doughnuts that are spectacular? What kind of magic do you possess? these are so cute! and once again, i love the mini-ness of it :)that apricot glaze is truly inspired! Oh yay!! 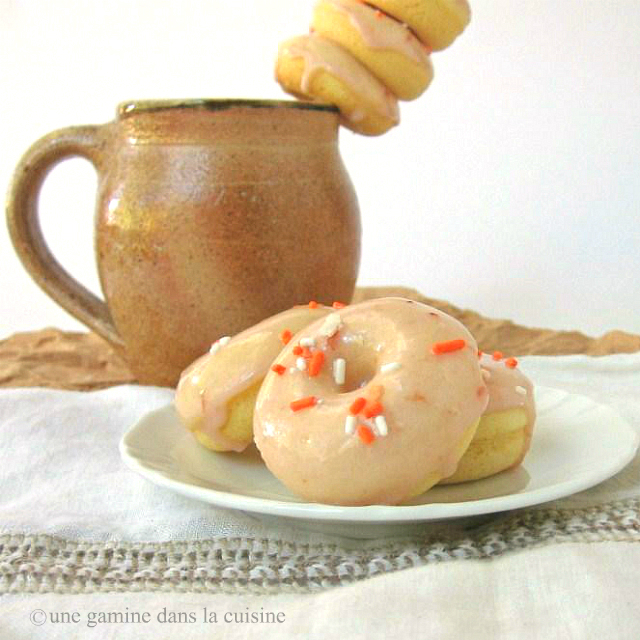 A doughnut without yeast! 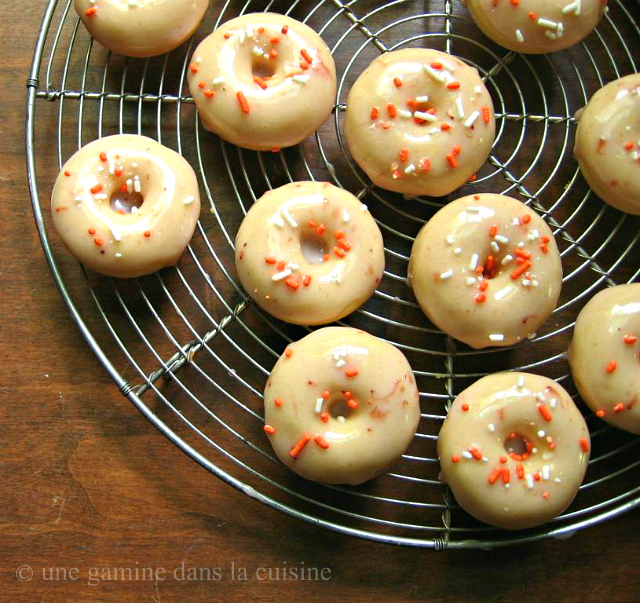 This is my kind of doughnuts to make...looks simple enough (but knowing me, my first try will always be sub-par!) Your doughnuts are so cute and I'm sure I can inhale a baker's dirty dozen in a heartbeat! I'm doing a Lost marathon now, so these will be perfect! @Jen, A Lost marathon is a fabulous idea!